Japanese Bobtail Cats are fascinating and beautiful. This breed has a long imperial history. It is a small and rare breed native to Japan, but one that has developed naturally, and as such is a strong and healthy breed. 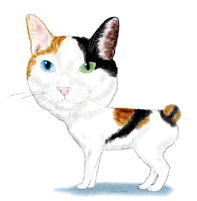 Where did the Japanese Bobtail Come From? So who brought the cat to Japan? The Buddhist monks. I am sure they loved their cats, but they had their practical reasons too – the cats protected their writings and books from rodents who did not respect any written wisdom and ate anything remotely edible. Books and scrolls were no exception. Some have estimated this arrival with the Buddhist monks occurred around 540 AD. The first written mention of domestic cats in Japan is from the diary of the Emperor Uda, 867-931. Around this time there is a mention of an abbot in the Nara area (which was the then capital of Japan), taming a beautiful stray cat. In the 11th century Tale of Genji cats are being mentioned - kittens that are born are noted. (The Tale of Genji are writings about the Imperial court). Diplomats from the Emperor of China brought the first cats to Japan as gifts to the Emperor, who then had Kyoto as his capital. (The Japanese word “neko” for cat resembles the Chinese word “likes (ko) rats (ne)”, which is considered a proof of this ancient diplomatic connection). The Japanese nobility so loved their Japanese bobtail cats that the emperor Ichijo decreed that cats should not work. Only then they could be aristocrats and live in the court. Yes, you read right – the cats were called “The Fifth Order of the Court” – a fifths rank of aristocracy. A legend tells how one emperor so loved his Japanese bobtail cats he decreed that no one else was allowed to breed them and during his audiences he had his cats with him in their red silk leashes. The silk industry was very important to Japan. Silk worms and cocoons were unfortunately considered good munchies by the rodents, and they were really threatening the whole industry. So desperate measures were called for – in 1602 the Japanese officials decreed that all the pampered Japanese bobtail cats were to be set free and buying and selling cats was from then on illegal. No one could keep house cats anymore. Why Bobtails Became So Popular in Japan? 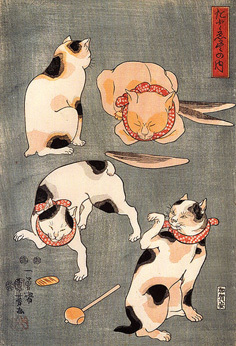 But why were the Japanese Bobtail cats so popular among the Japanese compared to the long-tailed ones? This may have something to do with the ancient superstitious belief about long-tailed cats. It was believed that they could grow a double tail, learn to walk on their hind legs and then enchant people (these kind of cats were called as bakemono in folklore – the name means a ghost or a goblin). But owning Japanese bobtail cats was considered lucky in Japan. The Japanese depicted their Bobtails in art already centuries ago. If you wish to see this art, there is a beautiful 15h Century painting of two long haired Japanese Bobtails at the Smithsonian Institute in Washington DC. Also in Gotokuji Temple near Tokyo has many Japanese Bobtail cats in paintings and an altar surrounded by Maneki Neko statues. And the Niko temple also has antique paintings and woodcuts of the bobtail. There is of course a story about how the Japanese Bobtail cat breed was born - it tells how an ordinary cat with a long tail had cuddled up near a fireplace in cold weather. The unfortunate cat had its tail too close to the flames and it caught fire. The animal tried to flee and bolted through the Imperial city, lighting up many of the buildings. This caused the destruction of the city and the Emperor was so angry he decreed all cats would have their tails chopped off from then on. The real reason for the bobtail is genetic, of course. 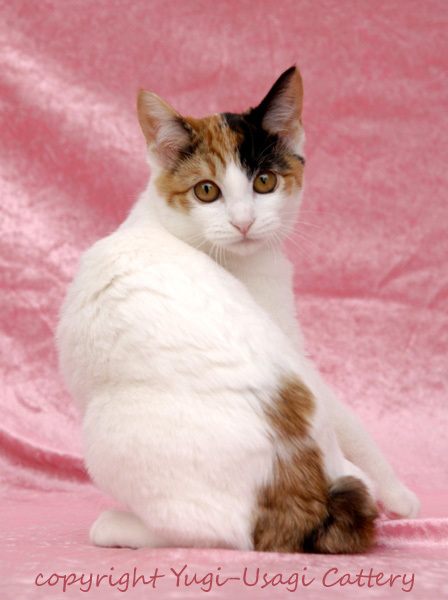 The Japanese Bobtail is known for its pretty pom-pom tail which has one or more kinks, curves or angles. All this is covered with longer hair which gives the effect of a rabbit-tail. The breed is otherwise very healthy with no genetic problems and has a high resistance to illnesses, but this cute tail is its weak spot and can be very sensitive to handling. So never try to straighten it – just appreciate its beauty without too much handling. The Japanese Bobtail cats tail is caused by different genes than the Manx – they are not related. You can see that even in their body type and having a close look at their tails – they are quite different. The Japanese consider the Japanese Bobtai to be a Good Luck Cat. You probably have heard of the Maneki Nekos? The cat that waves its front paw - you will see it on almost any Japanese store. If you wish to read more about the story behind this Good Luck Cat, Click here! Japanese Bobtail Cats have a lovely character - they are affectionate, devoted and deeply bonded to their family and very friendly. They love social environments. The Japanese Bobtail owners have a long list of words to characterize this lovely feline: charming, sweet-tempered, intelligent, outgoing, street smart… It is also a very brave breed – they say it is one of the most fearless cat breeds, confident and self-assured – just like a real Samurai, strong willed yet calm. This of course makes it easy to handle, take to cat shows and to family trips. Undoubtedly these characteristics have developed during the time the breed had to survive on its own on the streets for centuries. 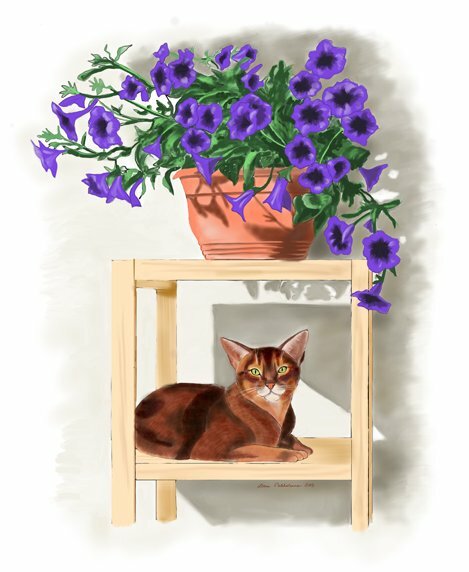 (Some say that if you would have to compare the character of a Japanese Bobtail to other cat breeds, the one that comes closest is the Abyssinian). If you are looking for a quiet, docile cat, the Japanese Bobtail is someone else’s cat. 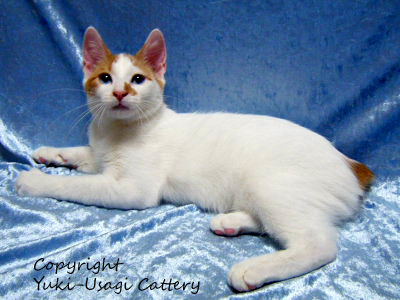 The Japanese Bobtail cats are very energetic, and playful. If you get one and don’t have the time to play endlessly, then perhaps it would be best you took two of them at the same time. The Japanese Bobtail cats get along famously with other cats and dogs, but is has been said it prefers its own kind. So the best cat companion to it is another Japanese Bobtail. Two females may have some issues about who is the boss, so a female and a male might be a better combination (neutered, of course, unless you wish to breed them). Did you know that the Japanese love cats so much that they have established cat cafés. These are places where people can come and spend time with cats if they cannot keep a cat themselves. Often, especially in the cities the apartments are so small that having a pet is not an option. You can teach the Japanese Bobtail tricks if it thinks it is fun. So walking on a leash – easy. Using the toilet – doable. Cat agility – they may really enjoy it. Carrying things in its mouth is the Japanese Bobtails favorite past-time, so it is easy to teach the cat to fetch (actually one wonders who teaches whom to this game…). The fun-factor is essential to this cat – and so if it has learned some no-no thing is fun, it can be pretty hard to un-teach it from a bad habit… So be sure also you have a good scratching post for your cat – and do not declaw! If you are trying to un-teach this cat, remember that negative reinforcement is not the way. This is a cat that will meet you at the door and show great interest in whatever you do. They are not exactly lap cats (though female Japanese Bobtails can enjoy curling on your lap too), but you will certainly find them sitting right next to you and also sleeping in your bed (or theirs, as they take it). A female Japanese Bobtail may be more attached to one single person, but will show its affection to other family members as well. They are talkative. They don’t have very loud voices, but they do know how to get their message across. real singers, they are. With their quiet, chirping voice they can express their emotions with a wide range of sounds. Not having a long tail does not affect the balance of a Japanese Bobtail – it is a good jumper and you should be prepared it might consider your shoulder a very good perch from where it can observe the goings on in its house (don’t worry, it will let you live there too). This cat has a smooth, silky, almost porcelain-like fur (if it is short-haired), and no undercoat. This means it is easy maintenance fur. Still – at least a weekly brushing is required. These cats shed a little, but perhaps not as much as ordinary cats (sorry – I know, there is no such thing). Their fur is also water-resistant and they enjoy water, some may even like to swim. You might expect your Japanese Bobtail to live 9-15 years, but they can live up to 20 years. 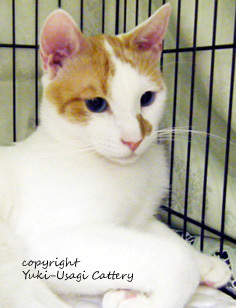 The first documented Japanese Bobtail was brought to USA already in 1908. The first registered Japanese bobtails arrive in 1968. People had become aware of this lovely breed when the US servicemen brought these cats home with them from the Second World War. 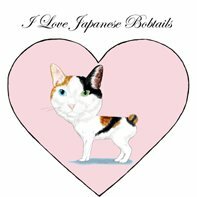 The Japanese Bobtail owners are devoted to this breed for a good reason - it is a fun, loyal, lovable cat. 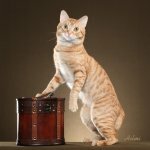 Do you own an Imperial Treasure of a Cat? Does your cat gobble up its food in one bite and then ask you more all the time? Did you know this might be a sign that the cat is simply bored and needs something to do. You giving them food is a Happening, so of course it asks for more. It is called comfort eating. An obese, bored cat is a sorry sight. So give your cat intersting things to do. Play with your cat - get new toys, a good scratching post - and if possible, take your cat out. (But in a leash - cats are in danger outdoors if let to roam freely).